In order to prepare UV-curable fluorescent inks and investigate the UV-curing performance, we report the preparation and photopolymerization process of fluorescent quantum dots (QDs) doped UV-curable ink systems. The ink system is composed of fluorescent QDs, photoinitiators, prepolymers and diluting monomers. Conversion rates of double-bonds are characterized by real-time Fourier transform infrared (RT-FTIR) spectroscopy to investigate influencing factors on the photopolymerization kinetics, including UV radiation conditions and system components. Experimental results show that radiation energy density of the UV light source, type and concentration of the photoinitiator, and concentration of QDs have a significant influence on UV-curing process of the ink system. Due to strong absorption effect of QDs in specific wavelengths, appropriate matching of the UV light source, photoinitiators and spectral characteristics of fluorescent QDs is essential to improve UV-curing performance of the ink system. This study provides guidance for the development of formulation and printing technology of new types of fluorescent inks. This study is funded by Science and Technology Program of Beijing Municipal Education Commission (No. KM201710015012, No. KM201810015012), Key Program of Beijing Institute of Graphic Communication (No. 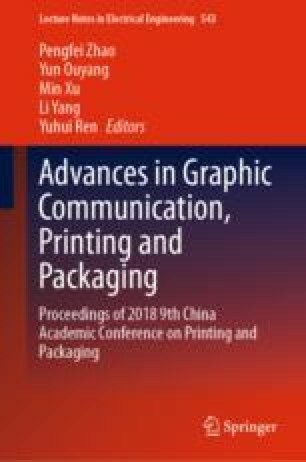 Ea201602), College Students Research Program of Beijing Institute of Graphic Communication “Preparation and Photopolymerization Properties of UV-Curing Fluorescent Inks” and “Research of Color Inks for 3D Printing”.